Am I strengthening his/her nervous system or just triggering it? Lessening anxiety or exacerbating it? “Although some activation in the nervous system will help achieve tasks, too much activation shuts down the horse’s ability to think. In this state of high activation, the horse goes into survival mode, responding instinctively and no longer learning. 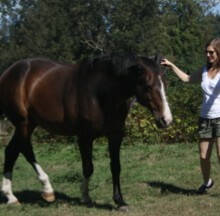 The great news is that we can work with our horses to strengthen the capacity of their nervous system. When we do this their ability to remain calm and open to learning and direction improves in situations that may have been quite stressful at one time. Is he learning skills that will help keep him safe in the human world, no matter who is handling him? This is something I am very passionate about. It’s easy to fall into only teaching our horse how he needs to behave to make us happy, to avoid working in the areas that make us uncomfortable. However, at the end of the day if we don’t teach our horses how to behave safely around humans we are doing them a disservice. I have been known to ask owners who allow their horses to walk all over them and push them around “because he loves me” the following question. If you dropped down dead tomorrow can you 100% guarantee that this horse will never be handled by anyone who may be uncomfortable with this behaviour? And is the behaviour something that may cause the horse to be treated harshly by anyone? Horses don’t equate setting or respecting boundaries with love. You can still have a loving, close relationship with your horse while teaching him what will keep him safe in the human world. Creating connection or programming cues? While it’s important to teach our horses to respond to certain aids and cues, it is not the most important thing. This comes back to the difference between “how” and “why”. Most of us are teaching these cues so that we can communicate with them more easily. Why do we want to communicate? So we can connect with them. I believe that desire for connection is the driving force behind every horse/human interaction. We are teaching aids as a means to finding connection. The truth is when we are too focused on teaching certain aids/cues we start to treat our horses like machines. In turn, they become anxious about doing the right thing. When this happens we actually pull them into the human condition and they become less present in the moment. This lack of presence, in both the human and the horse, leads to disconnect. The exact opposite of what we were striving for in the first place. So remember to ask yourself: Do I want a machine or a partnership with a living being? Am I building trust or breaking it? I think this question speaks for itself. My experience has taught me that if I am aware of the above three questions I can push my horse, and myself, out of our comfort zone while fostering trust and respect. Here’s to wishing you happy days of endless “why’s” and successful “how’s”!